Another mouth-watering meat sandwich. Not Rosie’s pulled-pork, but definitely yummy and super fast. A few Octobers ago, I tripled this recipe for a family gathering in New Jersey. By the end of the evening it was all gone. I’ve developed a few sloppy joe recipes for clients over the years. This one’s my favorite — not too sweet nor sour, with just the right balance of veggies and seasonings. 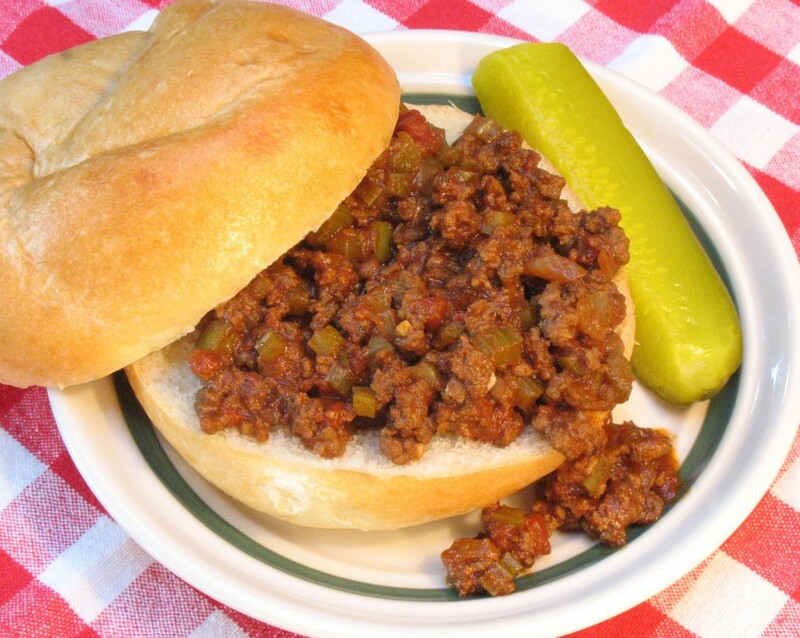 Sloppy joes fit the bill for casual entertaining or weeknight suppers. Beware though, they are sloppy! In a medium bowl, combine tomatoes, red wine vinegar, ketchup and brown sugar. Stir to dissolve sugar; set aside. In a large deep skillet or Dutch oven, combine ground beef with remaining ingredients, except tomato mixture. Cook over high heat 8–10 minutes, stirring to crumble and cook beef. Stir in tomato mixture. Reduce heat to medium; cook, uncovered, 15 minutes, stirring occasionally. Serve in buns, or over hot-cooked pasta. – I prefer Holland House wine vinegars because they actually hint of wine flavor, where others just taste sour. I also prefer Heinz ketchup. – Spiciness depends on the brand of chili powder used. Absolutely love this recipe! And obviously Sebastian does too…love the photo! Ha ha! I thought you both would enjoy the photo. And you do recall having the sloppy joes in NJ that time, huh? I, too, have developed several Sloppy Joe recipes for clients over the years, mostly inspired by my mother-in-law, who makes Sloppy Joes regularly and considers it one of her specialties. I love to vary the ingredients to give it a spin one way or another – for example, there’s a Latin-inspired Chorizo Sloppy Joes in my book, with corn and potatoes. Yumm. Like the chorizo idea! I had a line in my draft “There are as many recipes for Sloppy Joes as there are cooks.” So true. But to keep things short, the line got deleted. 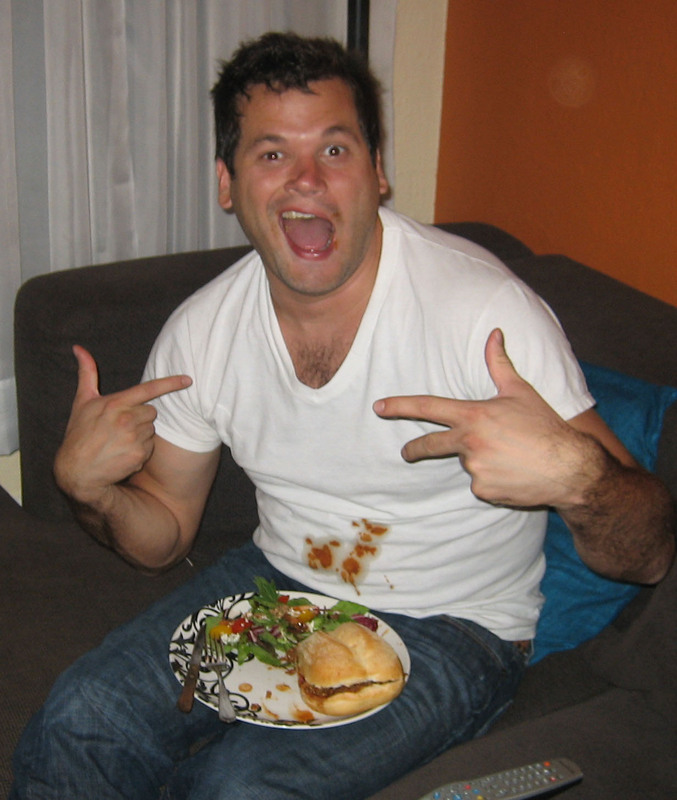 Hey, how about a sloppy joes party?! My husband would love these!!! I also like the Holland House wine vinegars. I’m looking forward to our red wine vinegar tasting next week.